Summary: The Fireplace Tour stops at the table and fireplace of Victoria Bradley, Table Magazine Editor-in-Chief, for stop #3. She and co-host, Helen Wildy, welcome the jagoffs to discuss the Wedding Issue for Table as well as a glimpse of Victoria’s amazing artwork, while Helen talks about comedic headlining. JumpStart Films founder Tom Kurlander issss hilarious.. as he talks films, music, graphic design and hollywood stories. Our Fireplace Tour sponsor, Shawn of J&D Waterproofing, celebrates their 8th decade in the business and Cydney Ballew from CoreLife Eatery weighs in on the 21-day challenge.Byron Nash, talks inspiration and brings it all together with his light acoustic sounds. If you don’t see the PLAY button above in your email, click the one below so that you can listen while you type nasty things to your local meteorologist. SPONSOR: Total Sports Enterprises is sending yours truly, John and Rachael, to Jergels THIS Thursday for a 90’s throwback with none other than Arthur Moats and TJ the DJ. Expect jagoff 90’s sports trivia, TSE prizes, a silent auction benefitting the LLS Student of the Year, and amazing music. Plus, all week, listen to the FAN for info on winning a JuJu MVP helmet. L I T and MVP are three letters to describe JuJu Smith Schuster, and we have your chance to snag a helmet he signed just for the Dollar Energy auction courtesy of Total Sports Enterprises. Check out the helmet on 937thefan.radio.com and be sure to visit tseshop.com for all of your black and gold needs. Question of the day: Talking a lot about art forms, drawing, music, comedy, writing. If BLANK was an art form, you would be perfect……what though? 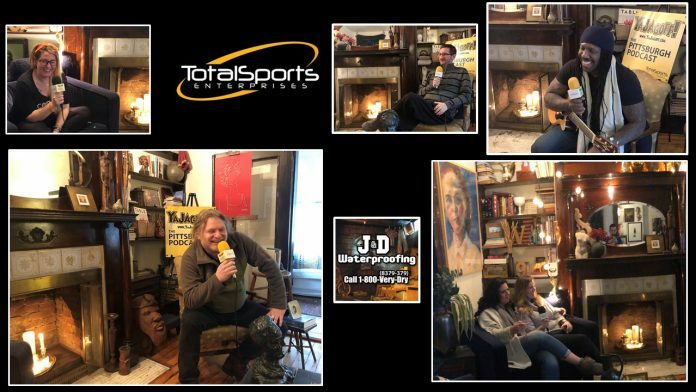 Shawn and company: J & D Waterproofing Sponsor Shawn sits by the cozy, candlelit fireplace to discuss all your home improvement and waterproofing needs during the winter season. As homes bunker down for the wintery mix, it is important to keep the repairs in your house maintained. When the snow begins to melt, be sure to waterproof your basement to stay cozy and dry! J & D Waterproofing celebrates its 80th Anniversary, dedicating its mission to serving the Pittsburgh landscape with its expertise in home improvement and waterproofing. Cydney: CoreLife Eatery tempts us each week with grain and green bowl and signature staples such as spicy chicken and rice noodles, Southwest salad, and (John’s Favorite) tuna while talking about broths in order to warm your soul. As the 21-Day challenge commences, it is vital to stay determined and mindful of healthy food options. Stay tuned, because CoreLife Eatery will begin catering in February! Victoria Bradley: Victoria, Table Magazine Editor-in-Chief, has the champagne and creativity flowing while welcoming the YaJagoff team and guests to her humble abode that should be in a magazine spread itself. Victoria discusses Table Magazine’s upcoming news that involves its first, exclusive wedding and celebration issue! Be sure to checkout her online studio of beautiful artwork of expression through the female body and calming landscapes. Helen Wildy: Helen Wildy, Pittsburgh Comedian, talks inspirations and elements for her passion in comedy while discussing the supportive, family-style atmosphere that the Pittsburgh scene has to offer. Stand-up comedy is her strongest form in artistic expression, but Victoria confirms that eating pasta is a close second! Be sure to check out all dates and times and find Helen in upcoming shows this weekend through Arcade Comedy Theater at 8 PM, Burning Bridges at 10:30 PM, while being comic in residence at Burning Bridges all of January! Tom Kurlander: Tom, singer-songwriter, actor, director, and advertising extraordinaire, brings his wit and charm around the fireplace in order to talk about his past work experience like movie debuts in Kindergarten Cop, Flatliners, and Young Guns II. Adding to his many talents, Tom is the founder of JumpStart Films that specializes in documentaries, films and commercials. Listen and laugh about his various adventures and projects like family shorts and 21Voices. Byron Nash: Musician Byron Nash strings his guitar to sweet melodies while talking about his musical inspirations, and the importance of taking time to focus, reflect, and regenerate yourself through music. Byron Nash will have upcoming performances through the Deutschtown Music Festival, Three Rivers Arts Festival while still making time to perform as Children’s Hospital. SPONSOR: Total Sports Enterprises s sending yours truly, John and Rachael, to Jergels THIS Thursday for a 90’s throwback with none other than Arthur Moats and TJ the DJ. Expect jagoff 90’s sports trivia, TSE prizes, a silent auction benefiting the LLS Student of the Year, and amazing music. Plus, all week, listen to the FAN for info on winning a JuJu MVP helmet. L I T and MVP are three letters to describe JuJu Smith Schuster, and we have your chance to snag a helmet he signed just for the Dollar Energy auction courtesy of Total Sports Enterprises. Check out the helmet on 937thefan.radio.com and be sure to visit tseshop.com for all of your black and gold needs. n June 16, 2007, in Pittsburgh, Pennsylvania, U.S.A. At the age of 3, Ashley started SPONSOR: Total Sports Enterprises is sending yours truly, John and Rachael, to Jergels THIS Thursday for a 90’s throwback with none other than Arthur Moats and TJ the DJ. Expect jagoff 90’s sports trivia, TSE prizes, a silent auction benefitting the LLS Student of the Year, and amazing music. Plus, all week, listen to the FAN for info on winning a JuJu MVP helmet. L I T and MVP are three letters to describe JuJu Smith Schuster, and we have your chance to snag a helmet he signed just for the Dollar Energy auction courtesy of Total Sports Enterprises. Check out the helmet on 937thefan.radio.com and be sure to visit tseshop.com for all of your black and gold needs. SPONSOR: Total Sports Enterprises s sending yours truly, John and Rachael, to Jergels THIS Thursday for a 90’s throwback with none other than Arthur Moats and TJ the DJ. Expect jagoff 90’s sports trivia, TSE prizes, a silent auction benefitting the LLS Student of the Year, and amazing music. Plus, all week, listen to the FAN for info on winning a JuJu MVP helmet. L I T and MVP are three letters to describe JuJu Smith Schuster, and we have your chance to snag a helmet he signed just for the Dollar Energy auction courtesy of Total Sports Enterprises. Check out the helmet on 937thefan.radio.com and be sure to visit tseshop.com for all of your black and gold needs.